The CueMix FX software enables you to control all the 828mk3's settings. MOTU's 828 FireWire audio interface has become something of an industry standard over the past few years. The company is now readying the mark 3 version for release, and this comes with built-in effects and mixing functionality. Also on the 'new features' list are a greater number of inputs and outputs (28 and 30 respectively), 192kHz performance, Hi-Z guitar inputs, signal overload protection, digitally controlled analogue input trims on all inputs, two banks of ADAT/TOSLink optical and MIDI I/O. 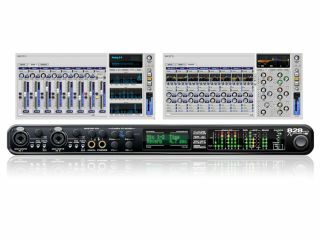 A rack-mountable device, the 828mk3 ships with MOTU's CueMix FX control panel software and the AudioDesk DAW. It's compatible with Mac and PC and comes with ASIO, Core Audio and WDM drivers. Expect to see the new interface in stores in February priced at $795. Full specs are available on the MOTU website.